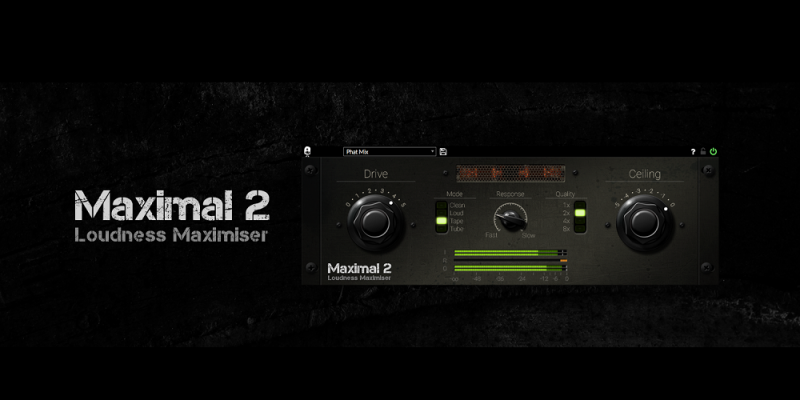 Maximal 2 is a plugin designed to enhance and simplify your experience when using music making software. It’s a loudness maximizer, created by the software maestros at Venomode, and it features an advanced look-ahead peak limiter and analogue modeled saturation. In essence, Maximal 2 will smoothly limit any peaks in the audio, and automatically increase the overall level. The analogue modeled tape and tube saturation modes encompass all of the best parts of the analogue world, without all the bad – such as high-frequency roll-off, hiss, wow and flutter. You control the effect: tell Maximal 2 whether you want the limiter to be fast and loud, or slow and transparent, and it will do what’s needed. You can also use Maximal 2 to catch rampant peaks in an audio recording, or, simply put, you can use it to make your track sound intense and loud – it’s entirely up to you. Maximal 2 has become something of a must-have plugin for home producers and musicians recording their own music for the first time. For something so simple looking, the effects are phenomenal – the control that it gives you over the final finish on your track takes away so much of the complex hassle of mixing and mastering. For something that is currently, notably inexpensive when compared with similar available plugins, Maximal 2 is a no-brainer. The results are superb, it’s incredibly easy to use, and it won’t leave a gaping void in your bank account. In short – everyone who makes music can use it, and they most probably should. Maximal 2 features an advanced look-ahead detection algorithm. Instead of just delaying the signal like some limiters do, Venomode use a special algorithm to react to the incoming audio naturally before it actually occurs. Not only do you get crystal-clear limiting with Maximal 2, there are some additional tools within that can help you inject genuine warmth into your track. Tape mode adds some warm saturation, modeled on the old tape-machines of the past, yet without the unwanted artifacts such as drift, wow, or flutter. Tube mode is slightly more boisterous, adding a bit of grit, while the ‘Loud’ mode takes the transparent limiter and adds in a variable state soft-clipper before the limiter, letting you squeeze a few extra dB out, while still keeping the sound clean. To help limit aliasing and to stop inter-sample peaks, Maximal 2 offers up to 8x oversampling. Their oversampling algorithm cleanly up-samples the signal before applying the limiter, then cleanly brings the sample rate back to the original. The price as it stands is just £29. Venomode are an impressive start-up, well worth supporting and always on hand should you have any questions about using Maximal 2 to get the most out of your sound. Highly recommended. Get hold of Maximal 2 over at Venomode. Find & follow Venomode on Facebook, Twitter & Instagram to stay updated.